The Paulick Report is once again pleased to offer its special print publication available online and on the grounds of the Fasig-Tipton Kentucky July Sale of Selected Yearlings. This edition of the PR Special introduces a new series, “Success Beyond Expectations,” focusing on highly successful stallions who entered stud without great fanfare or a bulging record of racing accomplishments. 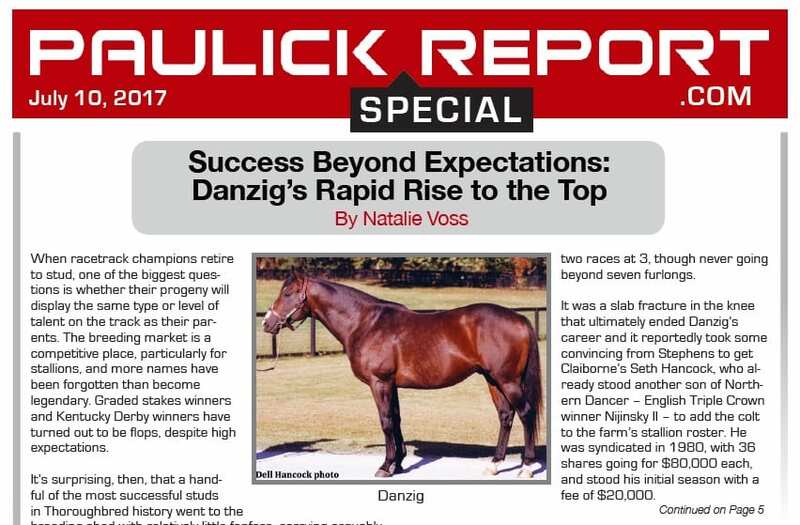 Natalie Voss writes about three-time leading sire Danzig in this first installment. On the subject of stallions, Frank Mitchell examines the prospects of some of this year's first-crop yearling sires in the Stallion Spotlight. In the Honor Roll focusing on a previous July Sale graduate, Chelsea Hackbarth recaps the progress made by the Quality Road colt Klimt from his purchase by Pete Bradley at Fasig-Tipton to his re-sale as a 2-year-old to his ascension as a Grade 1 winner. The Back Ring Q&A subject is Liz Crow, a rising star in the bloodstock world whose Elite Sales – which she operates with Bradley Weisbord – debuted in Monday's Fasig-Tipton Horses of Racing Age Sale. Five to Watch provides a close look at some of the July Sale's top hips in this edition of the PR Special. This entry was posted in PR Special, Ray's Paddock and tagged Cairo Prince, Claiborne Farm, danzig, elite sales, fasig-tipton, fasig-tipton july sale, Frank Mitchell, Horse Racing, klimt, liz crow, PR special, Thoroughbred Auctions by Paulick Report Staff. Bookmark the permalink.